Last year, flocks of TV presenters descended on the Ness of Brodgar World Heritage Site to explore ‘Britain’s Ancient Capital’. Even those of us with little time for rocks will have been impressed by the fact that in the new stone age, the world was upside down. Neolithic Orkney was the technological hub and its people lived in an advanced and complex society. On the treeless mainland, surrounded by gale blasted seas and treacherous tides, Orcadians used the available resources, and their ingenuity, to create an extraordinary society. But that was a long time ago. Nine years ago, when allocating lease agreements to investors in tidal energy, Alex Salmond, then Scotland’s First Minister, famously described the Pentland Firth. He referred to the six mile channel between Scotland and the Orkney Isles as ‘The Saudi Arabia of marine energy’. At the time, the comparison prompted a certain amount of scepticism. Today, as the world’s dependence on oil lessens, his statement doesn’t seem so out of place. Tim Cornelius, CEO of global tidal energy developer Atlantis Resources, is correct in saying Orkney has benefited from the skills and expertise migrating away from the oil industry. Cornelius himself, began his career in Aberdeen and on the North Sea rigs. He was one of the first to make the transition from energy extraction to energy creation, when he joined Atlantis Resources in 2006. His bold move paid off. In 2013, Atlantis Resources based in Edinburgh and Singapore, acquired MeyGen, Europe’s biggest tidal energy project. 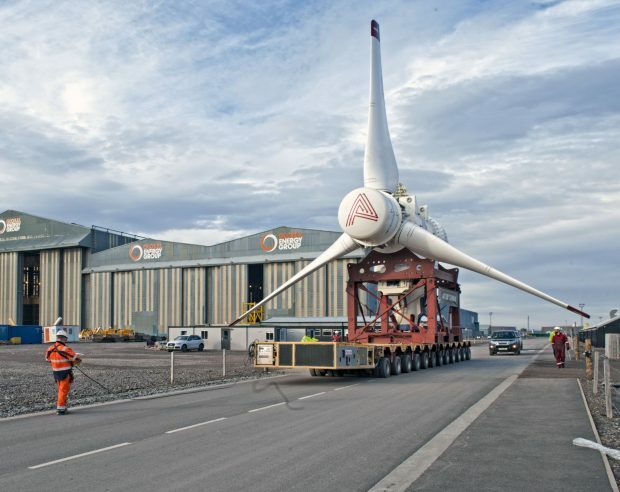 This year, the first of Atlantis’ 261 tidal energy turbines are being deployed 10 metres beneath the surface of the waters of the Pentland Firth. As ships pass overhead, all along the seabed the propellers of undersea turbines will be rotating slowly (12 times a minute). As they do, transforming tidal flows of up to 11 knots into 398 megawatts of energy – enough for 150,000 homes. Tidal energy offers a predictable, low impact energy source and the Pentland Firth has the potential to deliver up to half of Scotland’s energy requirements. Scotland, through its appreciation of its own engineering tradition and infrastructure, has embraced green energy. According to recent statistics, in 2014, over 40% of Scottish energy was generated through the renewable sector. One third of the UK’s renewable energy was created in Scotland. Scotland’s ambition to generate 100% of its energy through renewables by 2020 is on course. By transferring the skillset of the oil industry into the renewable sector Scotland aims to become a clean energy power exporter. The huge investment necessary to create enough power to really make a difference to an economy means that the best ideas must be steered by the best teams. MeyGen and Atlantis’ Tim Cornelius illustrates what, or who, is required. Perhaps Cornelius’ understanding of the international financial superstructure necessary to get a rig in production in the North Sea has enabled him to pull off the same trick for, as he calls them, ‘underwater windmills’. Cornelius has not blinded his investors with science, and he understands the importance of science and how to link the local with the global. Phase 1a of the MeyGen project is on course to complete this month. It comprises 4 turbines, 3 of which are manufactured by Andritz Hydro Hammerfest (AHH) in Germany (the AH1000 Mk1). The other one is manufactured by Atlantis Resources (the AR 1500), using 2 components supplied by Lockheed Martin. The Yaw Drive System and the Variable Pitch System enables the turbine to move autonomously so that it is constantly engaged with the tidal flow. Incremental, patent protected, advances such as this can only be made through practical experimentation and development under the waters of places like the Pentland Firth. Atlantis Resources are not the only entrants into the UK’s tidal energy market. There are many competitors, and, because, the tidal energy industry is at an early stage in its development, there is huge potential for change. All around the coast of Britain, wherever there is a corner, or an estuary, inventors and investors are tossing their new experiments over the side. Success is not guaranteed. 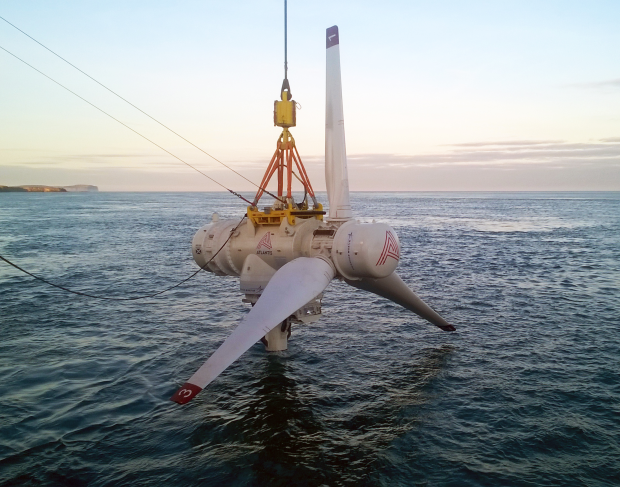 Off the coast of Wales, a home-grown tidal turbine sits at the bottom of Ramsey sound, temporarily unable to turn its propellers, as the 10 knot current gushes on. Today, the Orkney islands are as deceptive as ever. Through the creative exploitation of intellectual property, they have regained their position at the centre of the world as we move from the ‘oil age’ into a green one. Tidal energy is not about extracting a resource – it is about creating one. If you are imaginative, inventive and cooperative you can contribute to the mental Klondike. It’s about what you bring, not what you take. A good article but the MeyGen project will generate 398 MW, not 398,000 MW. 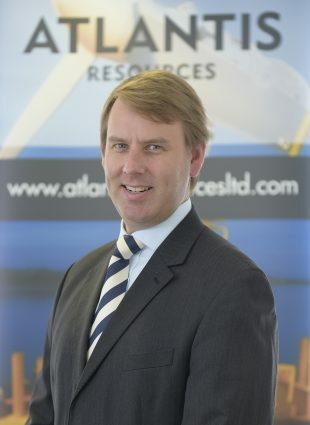 See https://www.atlantisresourcesltd.com/projects/meygen/. There's also a typo of "title" for "tidal". Thanks for spotting Peter. Glad you enjoyed the blog.